Our schools, teachers, parents and elders, all took a great care in exposing us to so many varied subjects and point of views. Many a times we do not realize its important when we went through it and rediscover it at a later point of time. There are 2 things about history that I remember from my school days. One I never liked the subject and two that I used to rote a lot of dates and name of kings during those days. But those were school days, and like everything else, my perspective towards history has also shaped differently over time. I feel fascinated by history now. Think of it, history is not just an account of great men and women. History is a collective story of the times. Ottoman Empire, Mauryan empire, Aztecs, Incas, European conquests - of course all the accounts of their times have given us heroes and villains (based on who wrote history), but history is not about individuals. History gives us a view into why things are the way they are. And it is so exciting to know that. Today morning I was hearing one of the history lectures from one of the princenton professors, Jeremy Adelmen. Today he was recounting and discussing about Older worlds of Eurasia meeting the newer worlds of Mesoamericas (14th to 16th century). He took a painting of interaction between columbus and native Indians in America. What is it that would have happened then? He asked his students to think. He asked us to consider that Incas and Aztecs were developed empires, so when Spanish people first contacted them, they would have been easily been outpowered in numbers. So how did they manage to defeat and rule these new worlds? It was an interesting point. And there were 2 reasons that were sighted in the discussion - one of it was ofcourse the spanish strategy, where they did not destroy the cities and places the way say the mongol did in 12th and 13th centuries in Eurasia. They just decapitated the elite ruling class and kept the political and social structure as it is. Another interesting reason was "Germs". Now this is particularly interesting. Within a few years of contact of Aztecs and incas with Europeans, their total population (and as the professor said, the numbers are debatable), decreased from 12 crore to 2 crore. The entire races were being wiped off by small pox, measeles, Typhus - Imagine that. A small army conquering bigger empires with weapons they did not even know they carried. These themes are beautifully covered in two of the books I read in last couple of years. I would like to suggest the same to you (both of it also had a BBC series made) - Guns, Germs and Steel by Jared Diamond and The Ascent of Money by Niall Fergusson. 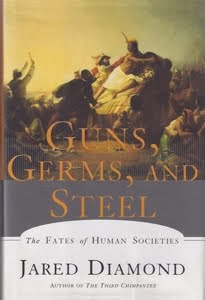 Guns Germs and Steel basically discusses the history from a biological and social perspective and asks the questions why history was shaped the way it did. Why did Africas, even after being the oldest human habitat did not become the richest. Why did Europe develop Guns germs and steel (and not the Americas) and why did they end up colonizing the world. It is a dry factual book, full of intersting stories at places :). 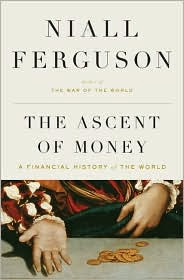 The other book , the ascent of money, is a brief history of money. How it originated and went across the world. How it got the value it does. What about gold? and the stock exchanges? and the tycoons, and the business families of Europe? How Money from medicis fostered renaissance in Italy and how stock exchanges were built in Amsterdam? It is a fascinating account and the author unlike Jared diamond is a flamboyant Niall fergusson, someone who doesnt shy away from expressing a strong opinion. There is so much to learn from our past. The customs, the traditions, the worlds that once existed and that has shaped the world we live in today. Now that I am finding that one subject interesting am sure, if we look back at our NCERT textbooks of civics and geography, science and Languages, Craft and Physics, Chemistry and biology, Business and Economy, we might end up suddenly cultivating a lot of interest in some of it. It also brings me to one of the typical subjects we used to have "Moral Science". Isnt that an important subject for kids. Shouldn't morality be taught in a structured comprehensive way. How can we do that? It is a good point to think through. In some ways, our vedic and ancient literature did take this at the core of all its material. Is interest in a subject a function of age? I mean, things like stories appeal better when you are kids, history when you want to explore the world in your 20s and 30s, science when you want to contribute in your 30s and 40s, philosophy and spiritual science in your 50s and 60s as you near the end? Can interest be a function of age? Are you rediscovering something these days. What is it?